Recently, Jeff Elder wrote an article for the Wall Street Journal “Social Media Fail to Live Up to Early Marketing Hype”, (http://on.wsj.com/1rHYi30), which was based on a survey done by Gallup the long standing polling company, saying that Social Media hasn’t performed as anticipated (http://on.wsj.com/1izsMUu). I read the WSJ article and the Gallup poll, and at first I was astonished as most of the WSJ’s readers probably were. Especially all of the social media managers and V.P.’s of Social Media in Fortune 500 companies throughout the U.S. I seriously considered that if these two bastions of business information and integrity said this, it might actually be true, but I instinctually knew better. “I am a SCORE counselor from Phoenix who specializes in Government contracts. …I do have a question: a Gallup poll whose results were published recently, seems to conclude that on-line advertising is useless and a waste. Gallup concluded that only a tiny percentage of people even notice them. The study targeted Social media. Their conclusion: Do not waste time on Facebook, LinkedIn, Twitter or similar services. I am interested to read your reaction to that extensive survey from such a prestigious organization. Jean’s email question forced me to take a more serious look at these serious accusations before I responded. Social media marketing is the same as any marketing. It takes time, resources, and a sound strategy. You have to ask, where’s the ROI in print ads or where’s the ROI in direct mail. It’s in there, that’s why we still do it. With social media, we also do it because there is an ROI when it’s done correctly. Social media marketing is still marketing and can be effective if done with a strong strategic plan. “Yes, of course, any attempt at marketing requires both excellent planning and effective execution if it is to achieve success. Social media marketing does not get a pass from that principle. But, just as it is true when you try to train a mule, it only works if you can get the prospect’s attention. An unseen pitch simply does not exist! “I would like to see a Gallup survey measuring the influence television commercials and print ads have on customers. I bet those numbers are even worse. True, with all of the noise out there, it is becoming more difficult to be heard. That’s why social media is a good choice. The poll said that social media has “A great deal of influence on 5% of the people polled”. Direct mail has only 1/2 of 1% response rate. That makes social media marketing 10x more effective than direct mail and significantly less expensive to implement. This leads back to a concept that is seldom used by marketing people, but is understood by nearly all sales people; The Sales Funnel. Just because you saw a truck ad or fast food ad on TV last night, doesn’t mean that you ran out and bought a big truck and a Big Mac® this morning before you went to work. The ad had no influence on you whatsoever, because your weren’t ready to buy either product. However, when you ARE ready to buy a truck or a burger, you will think of the person / company that is in the forefront of your mind from Facebook, Twitter, LinkedIn, etc., and you will most likely buy from them first. The time that it takes you to go from first realizing that you need a particular product / service (awareness) until the time you actually purchase that product / service is call the Sales Cycle. For a truck, the sales cycle could be several years and for a pack of chewing gum at the checkout isle it takes only 30 seconds. The cycle is usually proportional to the cost of the item. The truck has a very long cycle the gum, very short. This is why, if you are a truck retailer, you have to stay in front of your prospects often and for a very long time to catch them at the very moment of awareness and influence them. The The Wall Street Journal article and the Gallup Survey was wrong and has no value from this perspective. “The Gallup Poll referenced by the WSJ article is interesting in that 62% of consumers said social does not influence their purchase decisions at all. Consumers don’t spend time attributing an item they purchase back to if and when they engaged or viewed brand content on social so it makes sense that 62% of consumers would state that social does not influence purchasing. When brands focus on creating engaging campaigns that make fans happy the brand wins every time. Torani is doing a great job of this currently, leveraging the World Cup, through a fun and engaging Facebook campaign that is converting fans into email leads at a 75.47% conversion rate. “Social drives brand equity and sales, it creates an emotional connection with customers and helps build customer loyalty through evangelists, it leads to greater exposure through search. In short it is critical in driving market positioning from the 4Ps (Product, Place, Price and Promotion) that have been in effect since the 50s to the 4Es (Experience, Everywhere, Exchange and Evangelism) Here’s my piece on Forbes on the subject: http://goo.gl/htvnf. Those who go through the trouble to create a general brand-awareness/audience connecting campaign through social media, see an increase in market share by then implementing very specific campaigns that are linked to short sale cycles. The “Old Spice” adverts that targeted influencers, reached all the way to Oprah and converted a larger slice of the target audience (women) are a case in point. Others are the Johnson & Johnson baby oil campaign in China, Pfizer’s dominance of the pharma league table for three years running now, Without a strong social component that is also amplified in search none of these would even have been possible. 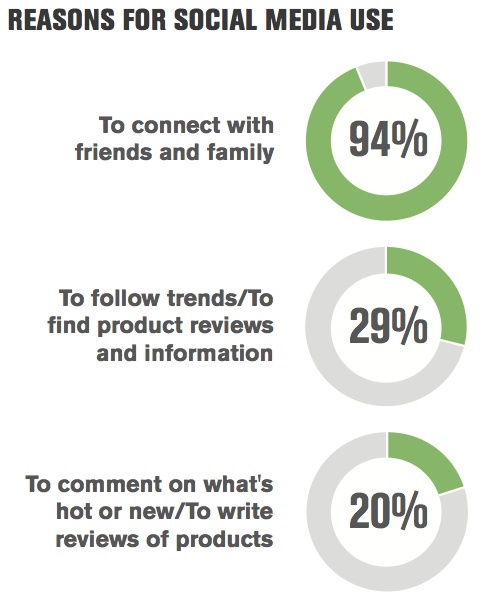 What the WSJ article and Gallup poll should have said was “35% of all people who participate on social networks are influenced at some level to buying your products!” That’s more than 1 out of 3!